Do our engineers sleep? Short answer: not really! 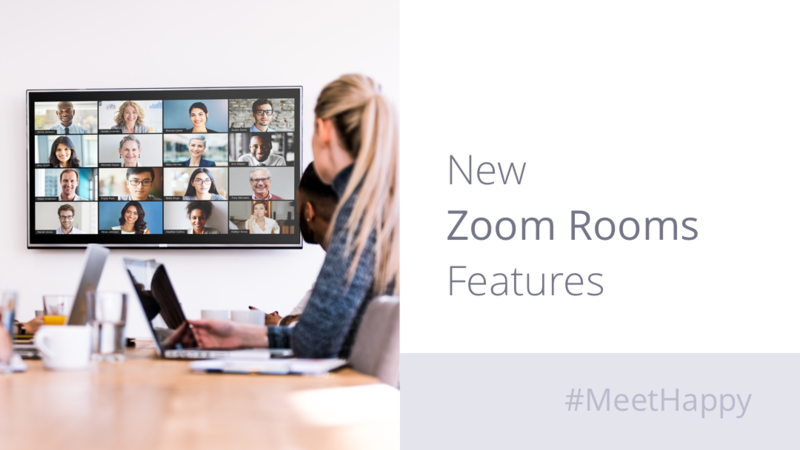 Hot on the heels of last week’s desktop, mobile, and webinar release, Zoom has dropped several new features for Zoom Rooms. You can find detailed information in our release notes, and below we highlight some key new features. With Zoom Rooms Check-In, admins can create the requirement that users need to check-in to a room they are using to keep their reservation. Users either check into the room on the scheduling display or controller, start or join a meeting, or use the screen sharing capabilities in the Zoom Room. If they don’t do this within a window of time (set by the admin) after their meeting’s scheduled start time, the room will become available in the calendaring system. This prevents people from blocking rooms’ calendars without actually using them and maximizes room utilization in the organization. You can now customize the background image of your scheduling display with your preferred image. This lets you fully brand your conference rooms with your logo, or you can even give each display its own image associated with that room’s theme. Zoom Rooms now support every language that Zoom supports on our mobile and desktop platforms. We already supported English and Chinese (Simplified and Traditional) in Zoom Rooms. Now Mac and Windows Zoom Rooms and iOS Zoom Rooms Controllers also support Japanese, French, Spanish, German, Portuguese, and Russian. Part of the frictionless Zoom Rooms experience is the ability to control a PTZ camera right from your Zoom Rooms tablet controller, and create presets for the best camera positions and zoom. Zoom has long supported cameras and speakerphones from our friends at Logitech. To make adjusting the camera angle and zoom even faster, we now support presets for two additional Logitech cameras, the Logitech Rally and the Logitech MeetUp. The Zoom Rooms Dashboard has long shown if there is an issue in a room, such as a disconnected device. Now we’ve added Health Status for each room that indicates “No Issues,” “Warning,” or “Critical,” depending on the severity of the issue. In the Zoom portal, the admin can filter their rooms by their Health Status. This makes it easier to quickly see which rooms may have issues, thereby allowing you to manage all of your Zoom Rooms more effectively. In June Polycom announced that we have teamed up to support Zoom Rooms with Polycom’s conference phone, the Polycom Trio. The Polycom Trio can run the Zoom Rooms controller interface natively, allowing the easy and powerful experience you expect from Zoom. The Polycom Trio firmware supporting the Zoom Rooms Controller will be available later this month (July 2018) and must be used with the latest Zoom Rooms version for full support. Zoom Rooms customers can update their rooms remotely from the Zoom admin portal. If all these exciting new features make you interested in our conference room solutions, you can sign up for a customized 1-1 demo to see these features and everything Zoom Rooms for yourself.